Cubital tunnel syndrome is a common type of nerve disorder in the upper extremity. This condition results from increased pressure on the ulnar nerve at the elbow. This is the same nerve involved when a person hits their “funny bone.” Patients may experience symptoms such as numbness, tingling, weakness, and pain in the hand and forearm. 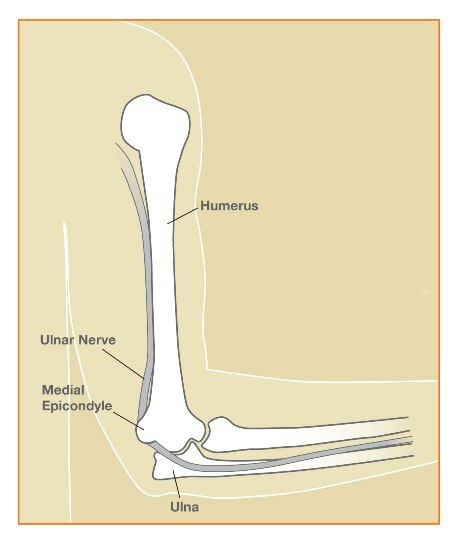 As the ulnar nerve travels from the upper arm into the forearm, it courses through the normal groove behind the medial epicondyle, the bony prominence on the inside of the elbow. The ulnar nerve is at risk for compression at this site – within the cubital tunnel – as it turns the corner around the back of the medial epicondyle. The nerve then travels down the forearm and innervates muscles in the forearm and hand and provides sensation to the small finger and a portion of the ring finger. It is thought that pressure on the nerve reduces neural blood flow, causing symptoms. Occasionally trauma, cysts, bone spurs, or anomalous muscles around the elbow are related to compression of the nerve; but, in most cases the cause is unknown. Basically, cubital tunnel syndrome is a “pinched nerve” at the elbow. Patients with cubital tunnel syndrome usually report numbness and tingling in the pinky and ring fingers, or a feeling that these fingers are asleep. Some people feel “electric” or “shooting” pain down the forearm into the hand, similar to the feeling of hitting “the funny bone”. Some patients report increased symptoms when the elbow is bent (flexed), such as while talking on a cell phone, driving, or sleeping. Dropping objects, clumsiness with the hands, or a weak grip are also common complaints. In severe or long-standing cases, the small muscles within the hand (intrinsic muscles) can become weak and atrophy, oftentimes permanently. This can lead to deformity of the hand, weakness, and dysfunction. Often the diagnosis can be made on the basis of your symptoms, medical history, and physical examination in the office. A nerve conduction study (NCS) and electromyogram test (EMG) can confirm the diagnosis and assess the severity of the nerve compression. Not all hand pain or numbness is caused by cubital tunnel syndrome. Nerves in the upper extremity can be compressed or “pinched” anywhere along their pathway from the cervical spine (neck) to the fingers. Therefore it is important to identify the location of the nerve compression. Non-operative treatment is tried first as symptoms can be relieved without surgery. Wearing an elbow splint at night which prevents the elbow from flexing too much can reduce symptoms. This can be prescribed in clinic or made at home with a rolled towel or pillow to keep the elbow straight (extended). Avoidance of prolonged and repetitive elbow flexion, pressure on the inside of the elbow, and vibratory tools may reduce symptoms. Wearing an elbow pad during activities can reduce the pressure placed on the elbow. Sometimes the symptoms are due to direct trauma to the ulnar nerve, and patients can improve with rest and time. 1. Decompression: The least invasive procedure is known as an “in situ release” or “decompression” of the cubital tunnel. This procedure decreases pressure on the ulnar nerve by removing the tight bands of tissue which press on the nerve. During surgery, the “roof” of the cubital tunnel (Osborne’s ligament) is divided through an incision on the inside of the elbow. The nerve is allowed to remain in its natural groove within the cubital tunnel. This type of surgery is shown in the surgical video below. 2. Anterior Transposition: An ulnar nerve transposition decreases pressure and tension on the ulnar nerve by shifting the nerve’s course as it travels around the elbow. During surgery, the ulnar nerve is moved out of its groove behind the medial epicondyle to the front of the elbow (anteriorly). At the conclusion of the procedure, the nerve is positioned in a bed of tissue either under the skin, within muscles, or beneath muscles of the forearm. These procedures are known as subcutaneous, intra-muscular, and sub-muscular transpositions, respectively. The surgery is performed on an outpatient basis, usually with regional/block anesthesia. Patients may use their hands for light activities immediately. Most people can return to light duty work after a few days. In most patients, a soft bandage is used to cover the incision and gentle elbow range of motion is allowed. A plaster splint is used if a “transposition” procedure is performed. Avoiding forceful lifting, pulling, pushing or gripping for approximately 4 weeks after surgery is recommended. The results are good-to-excellent for most patients. Most patients report decreased numbness, tingling, and pain in the hand after surgery. Recovery of the ulnar nerve after surgery is not immediate, and nerve recovery can take several months. Some patients do not regain full strength or sensation in the hand, especially in severe or long-standing cases. Mild soreness and numbness at the incision site often improves over a few months. Major complications from cubital tunnel release are uncommon. Possible complications include persistent symptoms, bleeding/hematoma, infection, and damage to the ulnar nerve. A skin nerve at the incision site can become irritated and painful in some patients. Image copyright American Society for Surgery of the Hand. The video is copyright Raleigh Hand Center. The information provided on this site is for general reference only. If you live in the Triangle region of North Carolina and have pain, numbness, and/or weakness in the hand, wrist, or elbow, please contact the Raleigh Hand Center to be evaluated by an upper extremity specialist.